NELLY Jaehne is proof that, with enough determination, almost anything is possible. After a lifelong interest in training horses, even being in a wheelchair for the past few years because of multiple sclerosis has not dampened Ms Jaehne’s enthusiasm. 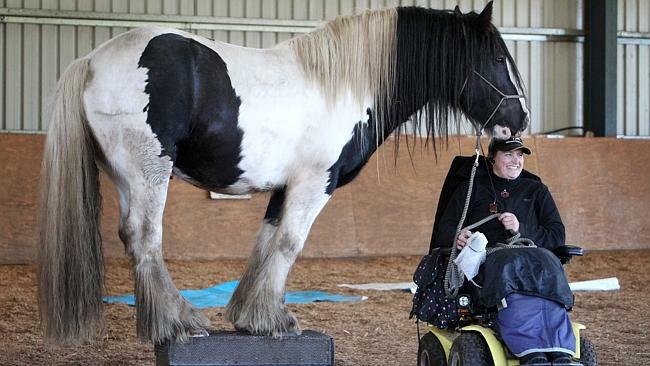 She recently showed a group of students from the Northern Support School some of her achievements with her talented six-year-old gypsy cob stallion, The Cardinal. “I think it’s important to show people that even though you may be in a wheelchair, there are a lot of things you can do,” she said. Northern Support School teacher Leanne McFarlane said there were some students in the class who already had a keen interest in horses, but the visit was a chance for all the students to have a new experience. “It’s just a really nice opportunity to get them out on an excursion and for them to be able to experience something different,” Ms McFarlane said. Ms Jaehne still trains horses for people and runs clinics where she helps people with their training. “When I’ve done demonstrations at Agfest and at Equitana, I get different reactions from people,” she said. “It hits everyone a little bit differently, depending on what’s happening in their own lives.